Good games on Maemo 5 is a rare occurrence, sadly. In fact, we started to expect as much, ever since the graphically impressive Bounce Evolution never went past being just a fancy tech demo. But looking past that, it did manage to show what the N900 hardware is rightly capable of with a drop of commitment from game developers. But it’s easy to spot the ultimate reasons for the lack of quality tittles for N900: the user base is very niche, and the still evolving Ovi Store only recently started to distribute paid content for N900 owners. But then there are a few exceptions. Angry Birds, for example, became a welcome smash hit the moment it appeared in the Ovi Store. The free version offers a healthy amount of physics infused puzzle levels to dive into, and there’s also additional level pack available at a price for those unable to resist the addictive formula. SPB Brain Evolution, while a different sort of game altogether, also excelled with it’s suite of 12 different mini challenges designed to train user’s memory and puzzle solving skills. But ever since the long awaited PR1.2 update for the N900 was released, Nokia was strangely silent on the other half of promise, mainly a new wave of content that ought to come to N900. Does anyone still recalls the few 3D games – Jurassic 3D Rollercoaster or Kroll – that were demoed quite a while ago? To close the circle of this story, among those games was Zen Bound, and it’s finally here in Nokia’s Ovi Store! Zen Bound. The tittle alone surfaces a string of warm memories that I treasured ever since I played this strange puzzle type game on my iTouch. There’s just so many unique things about it, and the more it makes me happy to see such game find it’s way to the N900. Zen Bound is a very slow, relaxing type of gaming experience. It’s best enjoyed together with headphones thanks to it’s excellent ambient track that silently hums just underneath a mixture of bell and rope-like sounds that accompany the gameplay. There’s a good reason why the music is such an essential part for this game. It creates a cushion that surrounds the player with it’s own pace, own rules, and brings the player to an almost zen-like state where time is the least important factor. And in that moment, all what matters is just the rotating wooded figure in front of you, and the string that is attached to it. Instinctively, you slowly start painting the familiarly shaped figure by wrapping the string around it. And it works wonders. Soon you’re lost somewhere between your thoughts and the world of Zen Bound. In a nutshell, the goal of the game is very straightforward. You must try to paint as much surface as possible by cleverly navigating the string around the rotating figure. The game requires zero effort to grasp the basics behind the gameplay, but it gradually gets more challenging as you progress through the levels. 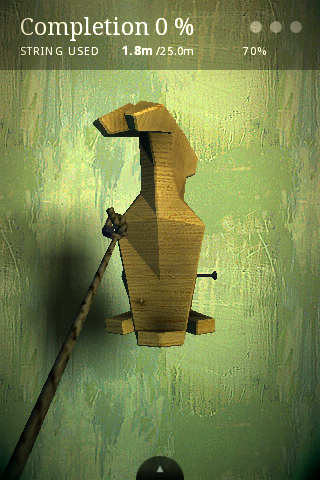 The wooden figures become more complex, and the limited length of string requires careful planing from the player. The word ‘patience’ comes into play, because Zen Bound knows no boundaries in time. You can easily unravel the string if necessary, and once you’re happy with your work, you complete the level by scraping the string against a nail. Further into the game, this brings along some really intensive moments when you’re playing a cat and mouse game by trying to avoid touching the pesky nail as long as possible. Depending how well you painted the figure, you are rewarded with flowers that will literally blossom on a tree that serves as a level selection screen. You only need to paint above 70 % percent of the figure to win a flower and clear the level, but getting near 100% is a tricky business for those who enjoy a challenge. Once you have acquired the necessary number of flowers (maximum up to 3 are rewarded per level), you will light up a hanging Japanese lantern that clears the looming darkness and thus unlocks the next set of wooden tags e.g. levels. It’s a long journey up the tree branches, but ultimately it’s all about the experience along the way rather than bluntly getting the biggest score. And thankfully, the game never takes the player away from the immersion for too long with boring menus. Some words should be mentioned about the controls. The game runs exclusively in portrait mode and utilizes both the touchscreen and the accelerometer. Here’s a useful tip: tilt the phone to angle the rope more accurately and gain access to those hard to get places. In that respect, Zen Bound feels nearly identical to the iTouch or iPhone version, yet there’re still some noticeable differences. To start with, the N900 version doesn’t have multi-touch support which makes the game slightly more challenging (mainly because you can’t spun the figure on it’s axis with the two finger gesture). The game still elegantly responds to player’s finger inputs even on N900’s resistive screen and promptly leaves any second thoughts far behind. The other noteworthy difference over the iPhone version is the larger screen resolution that results in sharper visuals for a game that was already visually stunning. Each figure looks realistically carved out of different kind of wood, and watching it sink in paint wherever the string touches it is a surprisingly rewarding experience. The stretched string, for the most part, also acts the way you’d expect from it, and only occasionally it gets stuck on edges in a weird fashion. Nokia N900 vs iTouch 2nd gen.
You could think these screenshots below are taken on the same device, only downscaled. Indeed, both versions of the game look almost identical, which isn’t necessarily a bad thing. To my disappointment, I couldn’t find the free download link in the menu to the outstanding soundtrack by ‘Ghost Monkey‘ like it’s in the iPhone version of Zen Bound. These sort of little niggles slightly lowers the overall value of the game, especially given the fact the game already costs more in Ovi Store. Secret Exit, the developer of Zen Bound, has managed to create a truly innovative and long lasting experience that shouldn’t be missed out by anyone who wants to try out something simple yet deeply involving. With the limited selection of quality games that N900 owners are exposed, the choice should come up extremely easy. Zen Bound II is already available in Apple’s App store with new gameplay features and improved graphics, and I sincerely hope that the sequel will eventually reach us as well to deliver on those unforgettable and quiet moments. Zen Bound has earned it’s place in my N900 apps list, well done!